PETALING JAYA: UEM Edgenta Bhd will be turning to private hospitals, including those outside Malaysia, for support services contracts following a reduction in the number of government hospitals it is servicing. Its managing director and chief executive officer Azmir Merican said the group services only 32 government hospitals effective April last year, compared with 81 previously. This will reduce its profit for the year ending Dec 31, 2016 (FY16) by about RM45 million. Services provided to the government hospitals include biomedical engineering maintenance, waste management and laundry services. Azmir said initiatives taken to address the smaller government concession include introducing new services and support services in other non-core areas. “We will also expand beyond the current scope of concession, which could mean looking at other private hospitals as well as other countries such as India or even re-entering the UAE (United Arab Emirates) in the healthcare segment,” Azmir told reporters after the group’s annual general meeting. He added, however, these measures are likely to take place after the current year. 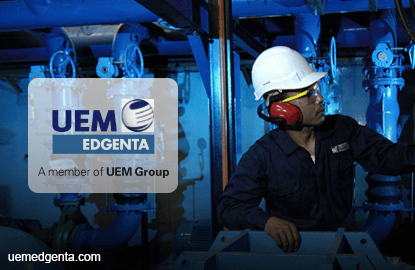 Azmir said that in view of the challenging period ahead, UEM Edgenta will strive to protect and enhance its core business, and grow its new business offerings, in order to sustain its financial performance in FY16. He said the group, which has an order book of RM6 billion, is on track to establish active facilities management and Internet of Things capabilities in its business. He added that UEM Edgenta will establish a command centre at its headquarters for its energy management system for the government hospitals it is servicing, as well as a research and development (R&D) centre in Bukit Berunting, Selangor. The R&D centre will house, among others, a pavement research centre, focusing on the development of different pavement materials from recycled waste and milled pavements, which promotes greater sustainability. A premix plant is also planned to be set up to produce various pavement materials. The estimated total investment in the command centre, R&D centre and premix plant will be around RM22 million, said Azmir. UEM Edgenta’s revenue for the year ended Dec 31, 2015 rose 1.1% to RM3.12 billion, compared with RM3.08 billion in 2014. Net profit, however, dropped 5.54% to RM191.2 million from RM241.9 million, mainly due to the one-off cost arising from a mutual separation scheme.